Great race today at the Barn Burner just outside of Flagstaff, AZ. This was by far the hardest race I have ever done – 104 miles of double track forest roads – some very bumpy, some very sandy, some very crazy, all of it a whole lot of fun! I was happy to finish 4th overall, but sad to lose my Garmin Edge 800 with approx. 25,000 miles on it. It was a Le Mans start, which means you ran to your bikes mounted on bikestands or being held by your support crew. I opted to have Kristine hold my bike so I wouldn’t have to try and extract it from all the bikes jammed together on the bike racks. I ran kinda slowly because I don’t run well and because the terrain had some lava rocks and there were tons of people jostling together. I met Kristine behind the bikestand area, mounted my Garmin and took off running through the grass to get back to the dirt road. By this point dust was everywhere, and I was easily 100-200 riders back. The first mile of the race was on some dusty, sandy rutted roads so it was really hard to see a good line and you didn’t want to get caught in the deep sand so I could only pass a few people here and there – but as soon as we turned onto the main forest road, the terrain tilted upwards on a long false flat. I passed probably 100 riders through here. At the beginning it was streams of riders that I was passing, but then it has started to break up into small groups – so I started to catch and pass these groups. Right before the lefthand turn onto the next rutted sandy section, I latched onto the back of a fairly large group of maybe 10 riders. It was here that I realized that mountain bike racing requires a lot of trust/faith in the rider immediately in front of you. You are trusting that they are going to take a good line and not crash. This section of the course really emphasized that trust because there was so much dust you couldn’t see the ground in front of you – you could only barely see the wheel of the rider in front of you. It was at this point that I lost a bottle when the road unexpectedly dropped a good 2-3 feet into a rounded rut/hole. I wasn’t expecting it so my weight was forward and I ended up coming out of the hole doing a front wheelie. Luckily the ground was smooth long enough that I could get the rear wheel back down without flipping over the handlebars. Hitting the hole popped out my water bottle so I did the entire first lap on one bottle. Not too long after the front wheelie, the group I was in came out onto another stretch of road which was much harder packed. I went to the front and tried to rally the troops, but I ended up dropping that group and catching one or two more groups until I finally latched onto the back of the lead group. I knew I had reached the front group because there was no more dust in front of this group. This was towards the top of the long gradual descent before the first climb. This part of the course was super fast, and we were absolutely flying single file trusting the rider in front of you to take a good line. For about five minutes, this was my favorite part of the race, but then I felt something hit my knee. I thought it was my only water bottle popping out of the cage so as we are motoring along I’m looking down and doing a double-take to see if it’s my water bottle. It wasn’t, so I continued staring hard at the wheel in front of me following his line. Then I glanced at my handlebars and noticed my Garmin was gone!!! I debated for another 10-15 seconds about turning around or keeping on going. I realized the Garmin was worth too much to just abandon – so I turned around and rode backwards on the course. It had been a couple minutes of fast riding since I had felt something hit my knee (which I assume now must have been my Garmin), so I had to ride back a long ways but I never did see it. It is quite an understatement to say that my motivation was completely gone by this point in the race. I was about to attack the Strava KOM challenge segment hard, and now I not only wasn’t going to be able to do that – I had lost my great position at the front of the race and given the leaders a good 5 minute head start. Frustrated at not finding my Garmin, I went flying up the climb that started shortly after the stretch of trail where I couldn’t find my Garmin. It was the more technical of the two climbs on the course, but I didn’t care – I just flew past everyone no matter what line I had to take. By the top of the climb, the race was all blown apart and people were by themselves and no longer in groups. After the top of the climb, there was a short rolling section followed by the longer, rockier, and more technical of the two major descents. It started out super fast on a mostly clean but a few high speed rocky sections that you could roll over, but then there was a hard left turn on loose dirt that required clipping out for balance that immediately led into some nasty rocky sections that you just had to blow threw as there wasn’t much of a clean line. I went really slow through here on the first lap – getting passed by two riders, the second of which came by probably 10 mph faster just riding over all the big rocks I was trying to avoid. So that is when I learned that you can do that – just bomb over rocks at 30mph – the bike and wheels can handle it these days! Once I reached the bottom, I continued passing riders all the way to the start of the second climb – the longer, steeper, and less technical stair stepper. In fact, I almost ran right into the back of a small group of three because I had been so intent on catching them that I wasn’t looking for turn signs. I caught them right at the turn and had to slam on the brakes skidding for some distance before stopping just shy of ramming into the last rider. I immediately passed them and continued passing riders all the way up the long climb. At the top of the long climb was a super fast steep descent. I didn’t have my Garmin, but it felt like I hit 50mph on this descent on the first lap. There was one clear, clean line between loose gravel/dirt and larger rocks on either side of the foot-wide line, but the line was clear, non-washboardy, and had no rocks in it — on the first lap! I almost wrecked here on the second lap because I tried to take it at the same speed as the first lap, but 1100 riders doing that descent on the first lap had loosened up soil on the clean line and created a bit of washboarding so that it no longer felt safe to go really fast. So each lap of the race, this descent got a bit sketchier and slower for me. After the steep, sketchy part was a harder packed fast double track that went next to some sort of campground before turning onto the original national forest service road leading back up to the two-way Barn Burner entrance road. I flew through this part catching one or two more riders, and I heard someone yell out “ninth” as I made the turn in towards the barn. At the end of each lap, you have to dismount your bike and run through the barn. Below is a video of me coming through the barn at the end of my second lap. You can see Analise waving the chain lube that I desperately needed because of all the dust/dirt on the course. My pit crew was just like a Nascar pit crew! Josiah would hold my bike, while Analise would hand me bars/gels/chain lub and Kristine would refill my bottles with gatorade. I would stand there eating and drinking whatever I could get down before Kristine finished with the gatorade. It was so awesome – less than 30 seconds to have two new bottles, a lubed chain, more gels/powerbars, and then off again. On the second lap, I was caught by a rider wearing a green Trek kit and the two of us worked together catching another rider to form a group of three. We worked well together all the way until the second climb where I rode away catching and passing a few more people on the climb finishing the lap in 5th place. I rode the first half of the third lap alone eventually catching Derek Wilkerson who was in 4th place at the time. We worked well together catching and dropping the third place rider. Derek was a far better descender than me and had to wait for me after the descents. At the end of the third lap, I stopped with my pit crew to refill bottles and gels while Derek had enough to keep going. I was so tired I figured I would never see him again, but a relay rider came flying by on the long gradual false flat leaving the barn. I hopped on his wheel and dug deep to stay there and soon we had caught up to Derek who tagged onto us making a small group of three. I was digging way too deep, so when we turned onto the dusty long descent I decided to back off and do my best to pace myself to hold onto a top 5 finish. I cramped on the Strava climb, stopped, went easier until I got caught by another relay rider towards the top. I was able to stick with him until the descent, but then he dropped me hard on the descent. I was caught by one more team rider on the section leading into the second climb, and he really lifted my pace again – but he flatted shortly before the start of the climb. I went up the final climb knowing that I would need to go slow to keep from cramping again, but I continued to pass lapped riders many of whom were walking there bikes up the steep sections of the climb. I was able to solider on in a very easy gear to make it up the climb – but there were definitely sections I was wondering if I was going to have to get off and walk. I kept thinking that at any moment whoever was in 5th place would come cruising by. It didn’t happen though, and I made it up to the top, down the sketchy descent, and then turned on the gas one final time to make it to the finish line. It turns out that I was over 12 minutes ahead of 5th place so I could have taken the finish a little bit easier. At the finish (as you may be able to tell from the picture at the top), I was exhausted. It took a while to be able to get out more than one or two coherent sentences in a row. I sat on the gatorade jug for quite a while drinking chocolate milk and cokes. Two final videos before all the pictures – the first is of my finish. Look at Josiah cheering me at the top of the video near the far track, Analise near the turn, and then Kristine filming the video. It was awesome to come through there and see my family cheering me on. Also, there was a cool dirt bike track next to the barn so that the kids could spend the hour and a half between laps riding up and down the jumps and around the berms. Analise is tackling one of the jumps in the second video. 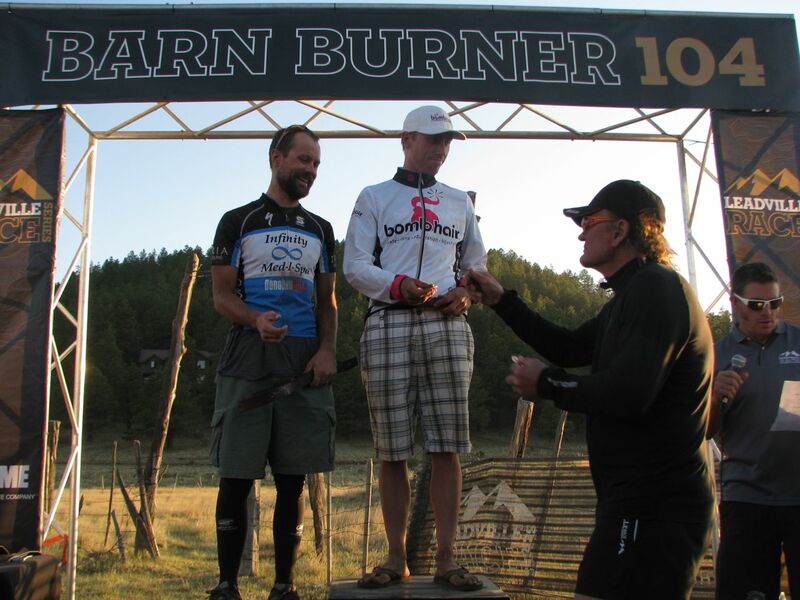 Podium for 30-39 yr old males … 2nd place for me … Ken Chlouber handing out Leadville entries! Arizona doesn’t observe daylight savings time, so this sunrise was just after 5AM. Solar panels powered the event – Kendrick Peak is in the distance. The race course circled the entire mountain. Josiah got in on the schwag toss at the awards ceremony – getting a cool water bottle. Ken Chlouber got the t-shirt and then gave it to Josiah, who wore it to stay warm! 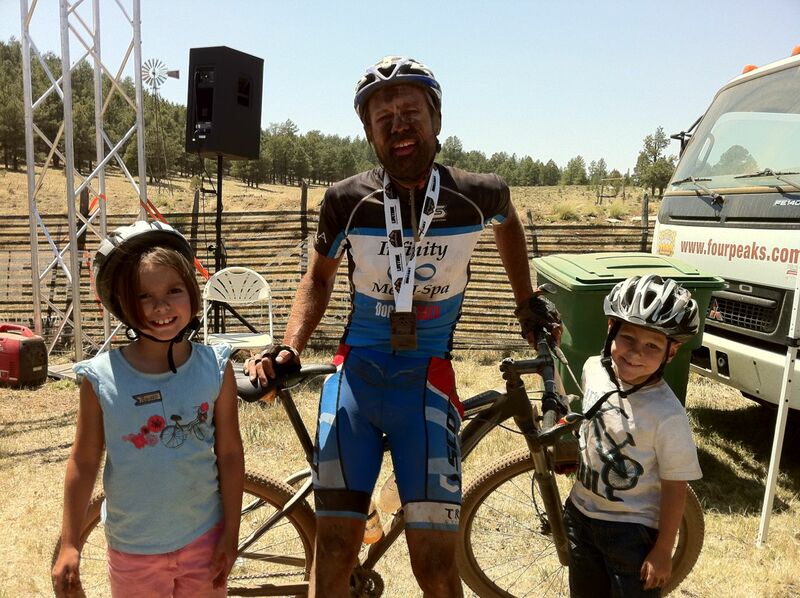 Dave Wiens (multi-year winner of the Leadville mtb race) handing out medals to some of the later finishers. Belt buckle and entry to Leadville – I’ll take it! 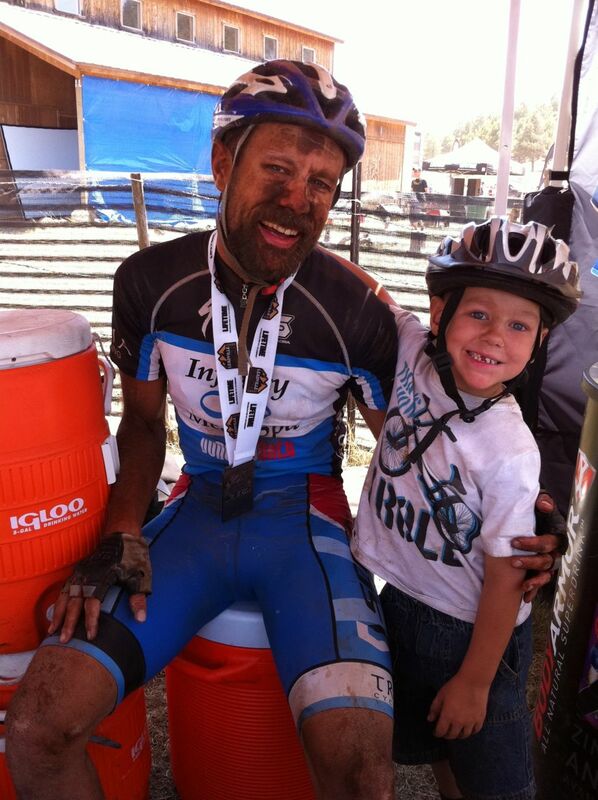 This entry was posted in Racing and tagged mtb, photos, podium, race, videos on June 4, 2012 by kartoone.